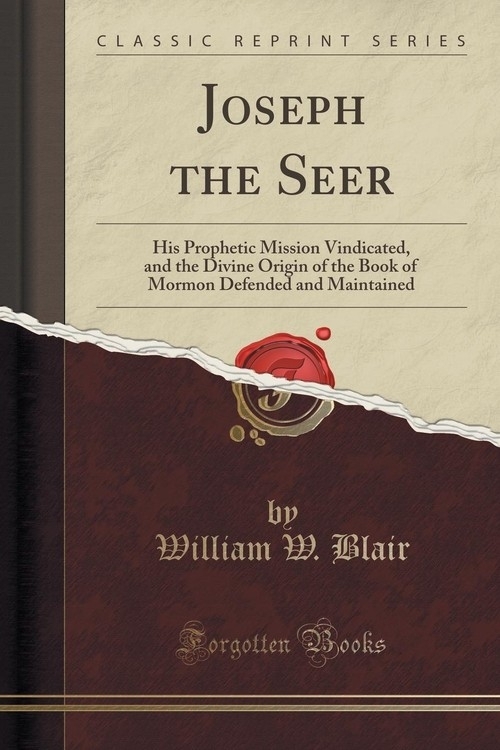 Opis: Joseph the Seer - Blair William W.
The severe trials to which the Truth of God has been subjected in all the past, have always resulted well in bringing its high importance, its essential impregnability, and its perpetual beauties into clearer, grander light, disclosing more plainly its deep, and broad, and immovable foundations. They have also resulted well in revealing the dark and delusive ways of error, ways so common to the conceited, the self-sufficient,, and the bigot, who, with blind heart, and clamorous tongue, or pen,, would compel all others into their mazy lines of thought, and into their devious and inconsistent modes of religious, moral, social, and scientific conduct. Truth gains and error loses in every fairly conducted conflict. Such, we trust, will be the ultimate fruits of the recent malevolent attack of Rev. William Sheldon upon the faith and doctrines of the Latter Day Saints, to which we reply in the following pages. Truth will arise and prevail. Mr. Sheldon, in his arguments, draws heavily on various anti-Mormon writers, from Howe to Ann Eliza. From these he takes his cue; and from their productions he obtains his chief enlightenment, and his loftiest inspirations; yet, notably, he fails to give them their proper credits. This literary piracy will be found to be quite in keeping with the general tenor of his work, as we proceed. It will also be seen that he is a prince among cavilers, and that he is as feeble in his sophisms as he is fertile in invention. He builds, with affected seriousness, his men-of-straw; and then, with self-complacent, pompous puffs, topples them over, and then applauds himself for decisive victories. Szczegóły: Joseph the Seer - Blair William W.
Recenzje: Joseph the Seer - Blair William W.